Having an ammunition reserve is one of the surest ways to ensure your family's safety during uncertain times. The 123gr 7.62x39mm Yugoslavian Military Surplus Full Metal Jacket will last for decades when left sealed and stored in cool/dry climate, and will help you to build your reserves quickly and at a fair and affordable price. Manufactured to former Soviet military specifications, The 123gr 7.62x39mm Yugoslavian Military Surplus FMJ was engineered for heavy duty use across a wide spectrum of climates. 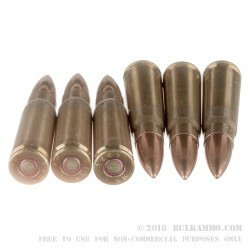 The 123gr 7.62x39mm round has an average muzzle velocity of 2,460 feet per second, and is capable of sustaining supersonic flight out to nearly 500 yards. 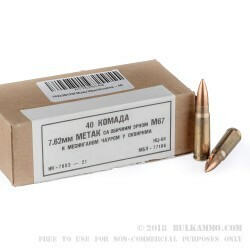 New brass cartridges make for a smooth and malfunction free feeding and extraction, and at a cost that even the tightest of budgets can afford, the 123gr 7.62x39mm Yugoslavian Military Surplus FMJ is one of the most economic rounds on the market for building up both your short and long term ammunition stockpiles. Quality,customer service, and fair pricing. Put 200 rds through my C39V2 AK. Loved it! Thought it was some of the best ammo I ever bought. And the crate its shipped in............ Icing on the cake! Ordered on a Monday morning , delivered Friday. Will be ordering my 3rd case soon. Great quality,mad quantity,and outstanding customer service! Ordered a crate of the yugo ammo. I ordered sunday night, and received today, tuesday mid-day. 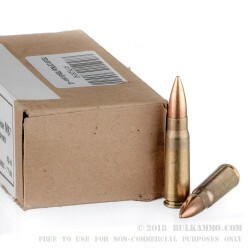 Fastest order of ammo I ever had, first time bulkammo customer. Anyhow, my crate was from 1976, very good condition for being 40 years old, the crate still had 1 tab that was under the seal, so I knew no one opened the spam can. The ammo is corrosive, but this is the only ammo thats available to U.S. customers at good price that is original military specification Ak-47 and SKS ammo, that is still apperently sealed!!! Q: Is this ammo in sealed metal containers in the crate? A: Hello Eric, The ammo comes in a sealed metal tin within the wooden crate with a rip cord to open it. Q: Does this ammo come in the wooden crate? A: Hello Dave, Unfortunately we cannot guarantee this ammunition will be shipped in the crate. The ammunition will be shipped in the metal wrapping. Q: This is non-magnetic M67 correct? A: Hello Jose, The M67 ammunition is non-magnetic. 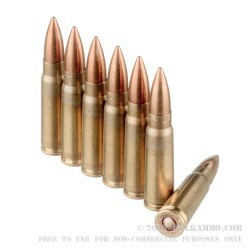 Based on the information that we have, the ammunition does use corrosive components but contains no steel. Q: Does this use a corrosive primer ? A: Hello Stacey, This Yugoslavian Surplus 7.62x39 ammunition is loaded with corrosive components. Q: Does this use a corrosive primer? A: Hello Isaac, The Yugoslavian 7.62x39 surplus ammunition is loaded with corrosive components.